Spain goalkeeper Iker Casillas faced an awkward post-match inquisition from his girlfriend Sara Carbonera, a sideline reporter for the Telecinco channel, following the defeat by Switzerland. During a post-match interview, the journalist asked Casillas: "How did you manage to muck it up?" And a shocked Casillas replied: "I don't know what to say. I don't know if this defeat will have consequences. The dressing room is fed up." Switzerland's Gelson Fernandes was as surprised as everyone else after scoring the winning goal in his team's historic World Cup triumph over Spain. The St Etienne midfielder's strike seven minutes into the second half of Wednesday's Group H match proved enough for Ottmar Hitzfeld's side to beat the European champions - and left Fernandes stunned. "I don't think I realise what is happening right now," said the 23-year-old. "I'm a bit surprised. It's a very special moment for our country and I'm very happy. We were definitely very good against Spain and we played very well as a team." Argentina coach Diego Maradona has again called on referees to protect flair players such as Lionel Messi in the World Cup, urging officials to be even stricter with offending opponents. 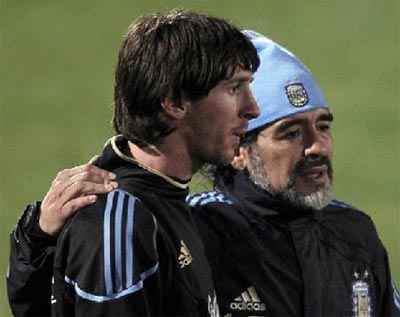 "If we are going to see a match when the star players are not going to be mistreated then I think the referees need to be a lot stricter, and if Korea's players do something to Messi or Carlos Tevez then they need to get out the yellow cards, and if it happens a second time, then that's it," said Maradona. Greece striker Theofanis Gekas is the latest player to call for World Cup organisers to ban vuvuzelas. Gekas was irritated by the noise in their opening game against South Korea, which his side lost 2-0. "I do think the trumpets should be stopped. They are affecting the players as we cannot communicate properly," he stated. Ivory Coast striker Salomon Kalou has called on his team take inspiration from North Korea's resilient defensive display against Brazil where they lost 2-1. Ivory Coast play Brazil on Sunday and the 24-year-old said: "I saw the first half of their match and North Korea defended really well and annoyed Brazil, they serve as a good example. We have the players who can make a difference, our strength will always be in attack but we must focus on defence."